In celebration of Earth Day (a couple days late--that's how I roll), allow me to indulge in some old fashioned sincerity, Oprah-love, and at least one metaphor. 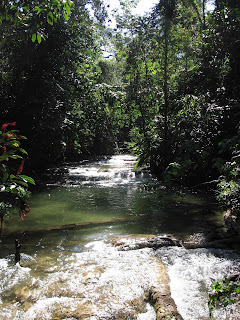 In the last few months it seems that the whole world has "gone green", doesn't it? Frankly, it's hard to keep up. Numerous major magazines have put out their "green issue", giving various advice about what we can all do to lessen our footprint, and several green-themed tv shows are debuting. There's no doubt that green has gone mainstream, which is what we want! On the other hand, I've been noticing a little voice in my head that fears what's on the other side of this trend: over-saturation, backlash, and worst of all, an unthinking substitution of extraneous "eco-friendly" products rather than a deep look at our consumption habits. You know, "green" shopping. So it was with conflicting feelings that I watched Oprah's Earth Day special the other day. Was she simply going to tout green weddings, carbon offsetting, and biodegradable water bottles? Much to my surprise and elation, Oprah opened the show by advising people to say "neither" to plastic and paper and to bring their own bags! She proceeded to give out reusable bags to every audience member--produce bags as well as larger grocery bags. Woohoo! The rest of the episode was--ok, I'll say it--what I would have written if I worked on Oprah. 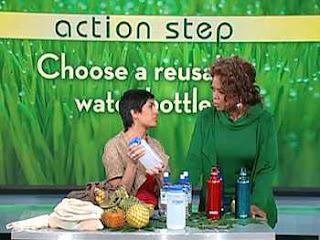 With the help of Treehugger's Simran Sethi, Oprah moved on to the cover all the basics--refillable water bottles (she even gave out Sigg bottles, like the one I use! ), non-petroleum based cleaning products, CFLs, using fewer paper napkins, refillable coffee mugs, buying recycled paper, reducing packaging, and stopping junk mail. 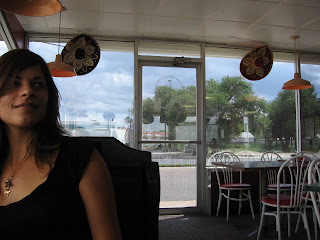 Simran even mentioned that she tries to take her own container for take-out!! It truly was "Going Green 101", and I was pretty ecstatic...can you tell? As much as people poke fun of Oprah's influence on our culture, it's extremely heartening to think of the ripple this is going to create. The however-many millions of viewers she has will at least think a little bit differently the next time they're at the grocery store and are considering buying a cup of noodles wrapped in styrofoam, cardboard, and plastic. The most exciting element of the show was that she highlighted "What families like yours are already doing". We got to see that there are mainstream families (read: not liberal-looking Californians) out there who have recently been inspired to move towards more sustainable habits. It was refreshing for me to be reminded that underneath all the media hoopla and the trends, the "basics" are sinking in on a very grassroots level. It was also very cool to see how excited the audience got when they got an insane amount of green swag--reusable bottles, bags, smart power strips, CFLs, green cleaning products. So maybe they were just excited to get free stuff. But those couple hundred audience members undoubtedly left psyched about everything Oprah taught them and will go home and give the reusable bags and refillable bottles a try. And they will influence their friends and family and so on. Today, I am grateful for the small ripples that all of our actions are making, and the huge ones, like when a big rock hits the pond. What ripples have you noticed lately? Talk to me! The good: Borders has started asking customers if they want/need a bag! The bad: The women in front of me were being snotty to the clerks "why wouldn't I NEED a bag?" Oprah is Going Green, Will You? It’s time to try the Get Clean product line, Natural, Organic, Safe for the environment. Would you try a small sample? It’s so safe for the environment, your kid can swallow the all purpose household cleaner and you won’t have to call poison control! Although we’re not endorsing you feed it to them as part of their nutritional food pyramid, we are promoting the healthy aspects of these products. You can request a sample on the top right hand side of the page. If you are health conscious consumer, or suffer from asthma, allergies, skin conditions (eczema, psoriasis etc.) then this is for you! Also available, http://www.kosherdietplan.com for you, if you want to stop yo-yo dieting. Lose fat, not muscle – once and for all.